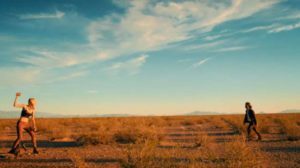 From the creators of Grave Encounters and Extraterrestrial comes the action-filled apocalyptic zolmbie horror-thriller It Stains The Sands Red. It’s zombie vs. stripper in the Vegas desert in It Stains The Sands Red. In the throes of a zombie apocalypse, Molly (Brittany Allen), a troubled stripper from Las Vegas, finds herself stranded in the desert with a lone ravenous zombie (Juan Riedinger) on her trail. At first, she’s easily able to outpace her undead pursuer, but things quickly become a nightmare when she realizes the zombie doesn’t need to ever stop and rest. Running low on supplies and beat down by the harsh environment, Molly will have to summon the strength she never knew she had to ultimately face both the zombie and the demons that have chased her all her life. Directed and co-written by Colin Minihan, this nifty, fresh and unrated entry in the zombie genre co-stars Merwin Mondesir and Kristopher Higgins.